A picture of a skeletal old man lying down near some hay is being circulated widely on social media as proof of a Jain monk fighting against cow slaughter by fasting to death. 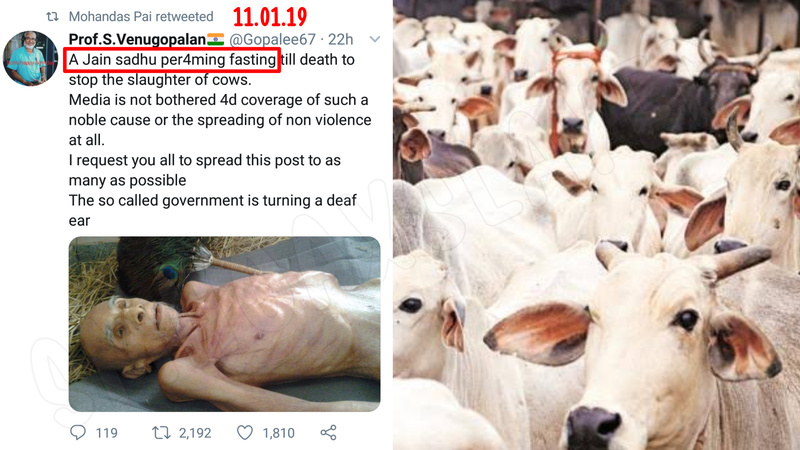 On January 11th, 2019, a twitter user by the name of Prof. S.Venugopalan tweeted the image along with the caption ‘A Jain sadhu per4ming fasting till death to stop the slaughter of cows. Media is not bothered 4d coverage of such a noble cause or the spreading of non violence at all. I request you all to spread this post to as many as possible The so called government is turning a deaf ear’ The tweet has since received more than 2,300 retweets and 1,920 likes. A Jain sadhu per4ming fasting till death to stop the slaughter of cows. Media is not bothered 4d coverage of such a noble cause or the spreading of non violence at all. The old man in the photo is indeed a Jain monk, as can be deduced peacock-feather broom lying next to him. Jain monks of the Digambara tradition are known to carry such a broom, which is known as ‘picchi.’ However, the rest of the message being circulated with the photo has no roots in reality, as the same photo along with a similar message surfaced on social media in early 2015. The message had also been doing rounds on Facebook and Twitter in the same year. WereBlog, a web portal, also published an article on February 13th, 2015, stating that the Jain monk was fasting to put an end to cow slaughter in the country. However, there is no evidence to establish the connection between the fasting and the attributed motive. In fact, Sallekhana or Santhara is a well-known Jain practice of fasting unto death by lowering food intake. Hence, there is no proof to conclusively state that the monk was fasting as a form of protest against the slaughter of cows in India. In any case, the Jain monk in the picture cannot be fasting to death currently, as the picture went viral on social media three years ago. Has the cause for which he fights (fought)for been addressed effectively Sir? If not, this post is much more valid to be shared widely. The photo accompanied by the message has been shared widely on social media from 2015 to the present date. ← BJP’s #10YearChallenge used old images as current achievements. I am a 21 year old pursuing a Master of Arts in Journalism degree from Symbiosis Institute of Media and Communication, Pune. I have a Bachelor of Arts in Psychology degree from St.Xavier's college in Mumbai. I'm a history buff with a special fondness for politics, arts and culture and human interest stories. Year old Photoshop. Modi ji didn’t meet Hafiz. Is the rock floating ? Credit to Photoshop, not God.